Most of the following reports have been culled from the local newspapers of the time, chiefly the Broadstairs & St. Peter’s Mail, which incorporated The Thanet News & The East Kent Times. This had its offices at the hub of the town at the Broadway. The intention is to give a flavour of what the town was like during this period. It is not intended to be a record of those who served, or their records of service, but of what happened in the town and to those who were left behind. Items include: - ‘German airship drop bombs on town May 19th, Concert at the Yarrow Home, Christmas puddings for every Broadstairs POW, Minesweepers appreciation, War Shrines, Shelled for ten minutes Broadstairs and Margate under fire, Invisible Zeppelins. On 21st January 1914, probably the first local intimation of war was at a Reservist's Concert held at The Grand Pavilion in Westcliff Road. The event was to raise £250 for a rifle range in Broadstairs to be used by the 28th (Broadstairs) Company of the Kent National Reserve, the Territorials & the Boy Scouts for rifle practice. Captain Peyton R N, the Officer Commanding of the 28th (Broadstairs) Company said, “If all those present read the daily papers, they would see month by month, year by year, that the war clouds were gathering over Europe, & it behove every able bodied man to prepare for the time when he would be called upon to defend his country, his own hearth & home”. The 28th already had 97 men on the roll, but they were no good unless they knew how to use arms. Their desire was to build the rifle range at Broadstairs, & he could see no problems with a town like Broadstairs being able to raise such funds. The outstanding feature of the second position of the programme was a tableau, which consisted of all the artistes who had taken part in the evening's entertainment. It was entitled, “Past, Present & Future”, which gave a vivid picture of Britain's fighting men. In the centre of the company were John Bull, & the figure of Britannia. Veterans, with their long rows of medals, The Buffs Cyclists, & sailors with fixed bayonets surrounded them. Accompanying them were the Boy Scouts, & members of the local fire brigade. Whilst they all stood, John Bull gave a fine rendering of Rule Britannia, all good rousing patriotic stuff. The national newspapers may have been full of the impending war, but Broadstairs continued as usual. In July the 3rd Kings Own Hussars were playing at the bandstand, & the town was arguing over whether 16/- a week was enough wage for the newly appointed Pierremont Gardens caretaker. He said he was quite happy with it, but others thought differently. The clock chimes at St Peters church had stopped ringing at the request of Colonel Prideaux of “Hopeville”, on account of his invalid wife not being able to sleep. The village took umbrage & a petition was raised to confront the vicar. It was a hot summer, holidaymakers still flocked to the town, & the bathing machines, & seaside concessions were still doing well. An added attraction was the 1st Battle Squadron anchored in the Downs on the 8th July. The eight vessels, all dreadnoughts, made a fine sight as they came up, & anchored in two rows off Deal. Two days later, the 5th Battle Squadron, all of the “King Edward” class were spotted off the Foreland. Local boats reaped a rich harvest taking visitors out to see the ships. On July 15th, Broadstairs had the opportunity of seeing eight water planes in full flight as they passed over the town at high speed. The annual swim from the Ramsgate Iron Pier to Broadstairs Harbour took place last Saturday, & was won by Mr Boucher of Broadstairs, who completed the 2 & a half-mile swim in 60 minutes, wrote the Mail. The only militants in the town were the Suffragettes, who had kept their heads down since the shenanigans at Margate. On 29th July, The Kent Cyclists Battalion were at camp at Callis Court, the home of Mr H H Marks. Twenty officers & 450 men were in attendance for the fortnight, & were receiving instruction, “in the work they would have to undertake in time of war”. By the 5th August, the mood of the country started to change. Refugees started to arrive from the continent into the Thanet towns. A fleet of taxis & charabancs were requested to arrive at Callis Court at 8 am on the 5th. The Officers of the Kent Cycle Battalion commandeered the lot, “Relinquishing the chauffeurs of their charges”. Returning visitors were also put out when they found the army had commandeered the local train service. Of the hundreds of French & Belgian schoolchildren receiving their education in Thanet, the youths were called back to their countries for mobilisation. In connection with mobilisation, a number of Austrian & German chefs & waiters, engaged at the various hotels & cafes in the district, were entrained to London, en-route to their own countries. The Mail reported, “This began on Saturday. Some of the local grocers had orders out of all proportions to the needs of their customers. Many well-to-do people, who could afford to stand the burden of higher prices, were lying in of stocks for weeks to come. This indiscriminate buying must bear more hardly on the poor. Prices are advancing, but the rush that is now taking place will only force the prices up higher. Many of the shops in the town had to shut early yesterday, so that they can complete their orders. Other shops shut early, because they had run out of produce to complete any orders”. A, Collection fund to be shared to other public funds as they thought expedient. B, Collection of gifts in kind to benefit the sick & wounded. D, Adoption of a means to allay panic & to offer advice & assistance where necessary. Mr. W Blackburn, of York Street, immediately stepped in & offered his warehouse, plus a man & horse & cart, all free of charge. Within the month £388 had been distributed, & Mr. Blackburn's store held 15 bolsters, 22 blankets, & 47 sheets, all gratefully received. Fifty more Broadstairs men were sworn in as special constables during September. Mr A Olby, the owner of the Vale Estates, & Mr H H Marks of Callis Court offered recently cultivated land for use as allotments, for the duration. The Mail reported, “It is no use waiting until the hard times are upon us. A little hard work now will bring rewards in the winter months. This is not a charity scheme, its value lies in preserving the self reliant spirit of our race, & a manly spirit, which will be required to the utmost in the months, or perhaps even years to come”. The fifty plots in the Vale & twenty eight plots at Grange Road were all quickly taken, Councilor Foster being the organizer. Owing to War Office orders, all of the military bands, which were to fulfil their engagements during the holidays, were withdrawn. The Council Band Committee has shown ready recourse to fill the gap & have engaged a string band, The Bijou Orchestra, to play at the Bandstand over the next few weekends. It is next to impossible to secure a full instrumental band. The Bohemia was full to capacity. Right from the opening chorus, “Gay Bohemians are We”, the company enter into the zest for their work. During the same week, “a large number of men left the town to take part in the war. Several ex-servicemen have volunteered for work of one kind or another, throughout, a number of cyclists & motorcyclists in khaki have been buzzing in & around Broadstairs, sometimes in groups & sometimes singly”. The first of the local men to enlist after the outbreak of war had been declared in August, were the Reserves & the Territorial Regiments. These were quickly moved away, & were re-introduced to the skills they had known on previous active service. They were quickly formed into the Expeditionary Forces, & sent to France or Belgium & into the thick of the action. A second army was soon required by Lord Kitchener, & volunteers were quickly called for. These volunteers would be untrained raw recruits, & local companies were quickly formed. Broadstairs, like the other two towns, had its own Volunteer Reserve, & had little kit & no uniforms, the only outward sign being a Khaki arm band surmounted by a crown. At first recruiting was slow with only ten volunteers in the first week; however with the formation of groups within the volunteers the numbers increased. The idea was for like minded groups of people to enlist together, this enabled men who worked together to stay together, but also enabled you to keep your social standing in the town, whatever that was, intact, so traders stayed with traders & bank managers stayed with their own kind, the professional classes, such was the class divide in 1914. Basic training was expected to take around seven weeks, but with so little kit to be trained with, the Volunteers were put to good use, guarding “things”, route marching, & coastal watching. Weekends were spent, combined with Ramsgate & Margate's Volunteers, in camp often at Cliffsend, Wingham, or Canterbury, usually having to route march to the site. Church parades were always another good excuse to combine the three groups together in a route march to Westgate or Birchington. Once in the Volunteers, the recruiting sergeants made their regular visits, & the fittest men, between the ages of nineteen & thirty eight were creamed off. Later this was reduced to eighteen, though it was still not permitted to have Volunteers on the Front till they were nineteen. At first as a Volunteer, men were able to designate which regiment they wanted to join. The recruiting sergeants did their best to spread the influx of volunteers around, but most men held out for their regiment of choice. Skilled mechanics were picked off quickly for the Royal Engineers, drivers for the Ambulance Corps, though most ambulances were still horse driven. As more men enlisted & left the town, even the local scout troop were called into action. The Scouts Work, Efficiency of the Broadstairs Troops. As conclusive proof of the excellent work performed by the Boy Scouts, the Government have now recognised their uniform as the uniform of a Public Service non-military body. On Saturday, a detachment were on duty near to the Power House, (Northdown Road), when some sparks from an engine set on fire several sheaves of corn. When the Scouts got to work, there were 40 sheaves alight, but labouring with skill & energy, gained the upper hand. The Scouts have pitched camp near to the Railway Station, & have the duties of patrolling all of the prominent buildings of the town. They are also guarding the pump house at Rumfields, & keeping watch on the coast at nights. The Mail started to publish the names of all the enlisted men & volunteers. 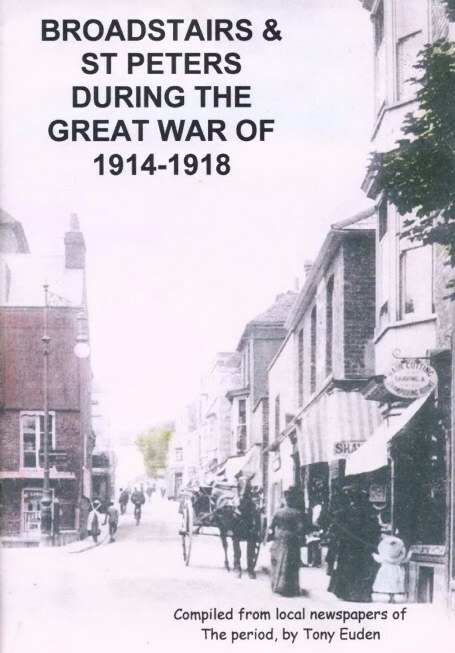 Of the 107 from Broadstairs & St Peters, 85 were in the National Reserve, 8 in the 4th Battalion of the Buffs, 2 joined the Surrey Yeomanry, 4 were in the Kent Cyclist Battalion, & 8 were in the Local Guard of Volunteers. The Local Guard were all over age to transfer to the regular forces. One week later on August 19th, there was a recruiting rally at the bandstand, where the Council Chairman, Dr Brightman, spoke to a large crowd about patriotism, duty, & the call to the flag. “The country was after time expired men, (veterans), up to the age of 42, & new recruits between the ages of 19 & 30. Let them come forward, many have responded. If Lord Kitchener does not get the men for whom he asks, an Act in the nature of the Military Act can be passed through Parliament in less than a day”. Thirteen new recruits came forward & signed up. On the civilian front nursing & first aid lectures were held by Dr Robins at the Metropolitan Homes in Lanthorne Road. Many Broadstairs ladies were assisting with the fitting out of Chatham House School in Ramsgate as an emergency hospital. Working parties were set up, knitting gloves, underwear, & bonnets for the troops, previously unheard of in August. The Yarrow Convalescent Home tried to scotch rumours that it was being converted into a Military Hospital, a rumour that became a fact within two months. Clothing was being supplied to the needy who had lost their breadwinner by the Prince of Wales Relief Fund. “Though it by no means presents the usual spectacle of thronging crowds, the scene on Broadstairs Front is not greatly different from that which we see in ordinary times. The beach & esplanades are still crowded. The entertainments are still well patronised, & the town is still essentially a pleasure resort”. On the other front, most of the Broadstairs veterans & reservists reported to Chatham House School or Wilsons Hall in Ramsgate, Chatham House for the East Kent Battery of the Royal Field Artillery, or Wilsons Hall for the East Kent Buffs. Those from Chatham House received their orders to depart for Dover. They all formed up in the school grounds, & were addressed by the Ramsgate Mayor, Councillor G Cook. In a few eloquent sentences, he commended the men on their patriotism, & wished them all God speed. His words were received with resounding cheers, which was taken up by the huge crowd of citizens outside the gates. The attachment of over 200 men, moved into the roadway in four columns, & proceeded to march down Chatham Street, the High Street, & Queen Street, which presented a remarkable scene, as headed by their officers they marched through the town on the commencement of their 18 mile tramp to Dover. Every vantage point was occupied by men women & children all eager to catch a glimpse, & all along the route there rang from every throat cheer, after cheer, after cheer, whilst flags & sticks were waived in the air. Those from Wilsons Hall were more fortunate, as the 100 men marched singing to the station to catch a train to Dover. Appeals for accommodation for French & Belgian refugees were issued by the various churches in Broadstairs, which were readily taken up as the visitors started to leave the town. Some troops remained in the town, & charity football matches were set up at Lindenthorpe playing fields for the Belgian Relief Fund. Such teams as the “Mowhawks”, the “Broadstairs Bloods”, “Kentish Cobbs” & “Goorkhas” were quickly formed amongst the soldiers. The Army Travelling Bureau was back in the town on the 16th September at the Rose Inn Yard. A detachment of the 4th Battalion of the Buffs was accompanied by the Yantians Band who struck up rousing tunes. The Chairman Mr C S Reed opened the speeches explaining why the Government wanted 100,000 men by Christmas, & every able bodied man who could be spared was wanted at the Front. At the conclusion of Captain Baird's speech requesting volunteers, the crowd cheered & clapped as a young strapping fellow stepped to the front to do his duty. At the conclusion of the meeting, the National Anthem was sung by all present. Over the next week a further 60 Broadstairs & St Peters men also stepped forward. On September 23rd, the Council lent on the local Justices of the Peace, who issued an order to all licensed premises in Broadstairs & St Peters, that they were to be shut, & empty by 9pm each evening. This brought a near riot in the town, as it was still possible to obtain “liquid refreshments” in the other two towns till 11pm during the week. The Justices relented, & granted a temporary extension till 10pm during the week, but shortly all towns fell into line, much against the Licensed Victuallers wishes. On September 30th, the Council received a communication from the Officer Commanding the Kent Infantry Brigade. “In the interest of public safety, I would ask you to arrange for the use of electric street lamps to be discontinued, & the streets to be lighted by gas lamps only, keeping the numbers to the bare minimum”. Another communication a week later requested that all premises facing the sea, refrain from showing any lights towards the sea, by either using blinds or darkened lamps, (whatever they were). Any street lighting on promenades or seafront roads was to be kept to a minimum, & those left on were to be painted a dark colour on the skyward & seaward sides. Once again protests were put to the Council, but this time it was Government Orders.
. That same week, the first of the local casualties were reported. Five Broadstairs men, so far as we can gather, were on the doomed cruisers, which sank in the North Sea. They are R H Brenchley, J F Horn, E A Jordan &, T J Miller, all of H M S Cressy, A V Strong of H M S Akoubir. Of these only one name has appeared on the lists of those saved, & that is E A Jordon. Of the rest nothing has been heard.